Created by the Leo Burnett' advertising agency in London, this advert has tapped into Hollywood sci-fi thrills for Kellogg's breakfast cereal - Crunchy Nut. This latest advert in the revitalised 'The trouble is they taste too good' campaign called 'Dinosaur', launches a new variant of the celebrated breakfast cereal- Kellogg's Crunchy Nut with Cranberries, Almonds and Yogurt Flakes. So, why is it (in my opinion) the 'World's Greatest Advert'? Well, it has the best dinosaurs of any advert that I have seen which makes it alright with me. Although clearly based on the kitchen scene in the first Jurassic Park film, these are not velociraptors. In my uneducated opinion they look like allosaurus, but I am happy to accept a more definitive identification. 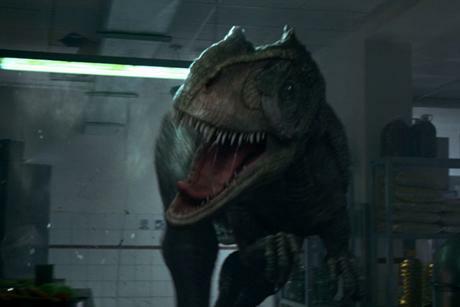 Dinosaur was directed by MJZ Rocky Morton, who also worked recently on Hanes Kittens, with creatives Ed Morris and Andy Drugan also lending their expertise. Rocky’s vision and use of cinematic lighting set a really terrifying atmosphere even before Framestore created the dinosaur. The biggest challenge for Lead Animator Nigel Rafter was fitting the 10-foot creature into the pretty cramped kitchen. The animation also had to fit around the physical effects that had been achieved in camera to make it smash through the room realistically. To add further realism, Anelia Asparuhova created a muscle system to help add weight to the dinosaur. The CG was then comped by Lead Compositor Simon Stoney using Nuke, with dust, debris, sparks, saliva and lighting effects being used to help sit the dinosaurs into the backplates. The spot was graded at Framestore by Simon Bourne, who worked with Rocky to achieve a dark and moody feel while keeping all the subtle colours and picking out all the lights and reflections around the kitchen. WHAT IS THE MOST VENOMOUS SNAKE IN AMERICA? WHAT IS A BLACK WIDOW SPIDER? WHERE CAN YOU SEE DOLPHINS? WHAT IS THE WORLD'S LARGEST REPTILE? WHERE DO YOU FIND BLACK WIDOW SPIDERS?